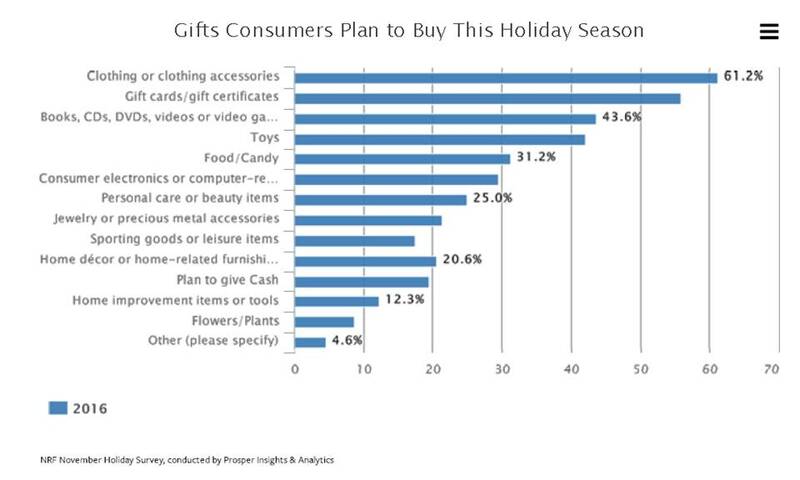 Yesterday’s post focused on the popularity of gift cards during the holiday season. Today, we take a broader look at what shoppers will be buying this year. This entry was posted in Part 1: Overview/Planning, Part 2: Ownership, Strategy Mix, Online, Nontraditional, Part 3: Targeting Customers and Gathering Information, Part 6: Merchandise Management and Pricing, Part 7: Communicating with the Customer and tagged 2016, competition, customer expectations, National Retail Federation, opportunity, popular gifts, Prosper Insights & Analytics, shopping. Bookmark the permalink.